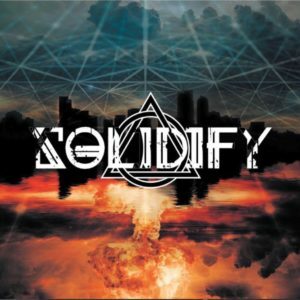 SOLIDIFY is THE hard rock band from Fort Smith, Arkansas with a heavy sound that’s still very accessible, This unique sound has been the driving force of the bands growing fanbase across mid-western Oklahoma, Arkansas, Missouri and Texas. They have been compared to bands such as Breaking Benjamin, Bullet for my Valentine, and the heavier side of Sevendust. Known for not only catchy hooks and meaningful lyrics their best known for their raw true to rock live show where the energy level hits a veritable ceiling and then shatters by the end! They recently hit the studio space with production from Kyle Simpson and Simpson Studios in Broken Arrow, Oklahoma and have released their first single "Insomnia" Picked up on apps such as Rock Rage Radio, Alchemy Radio and Element Radio, they have also received spins on The Fort 94.5's Arklahomagrown show, WMIC Miami and The Valley 97 FM in Canberry, Australia and the DOMKcast on KMOD in Tulsa, Oklahoma, and released the video to "Insomnia" quickly eclipsing 12,000 real views in a month. Solidify has shared the stage with such acts as SOiL, Texas Hippie Coalition, Paralandra, Wayland, City of the Weak, and Framing the Red and the list looks to be growing with each passing date!